If you are looking for a guest poster for your blog or an article for your online newsletter, please feel free to contact me. Learn how to optimize your blog so that potential cousins find it and want to contact you. Learn how to optimize your blog so that potential members find your blog and want to join your genealogical society. Learn how to optimize your blog so that potential clients find it and want to hire you to research for them. Learn how to use other social media tools besides blogging to attain your goals. Family Stories is where my family history blogging started. And? 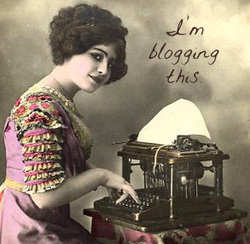 I'm still blogging there because we're never truly done, are we? Dead people like to talk. And I like to listen and write their stories down. Sometimes their stories are sad. Sometimes they're happy. And sometimes they're downright naughty [if I'm lucky]. So. Family Stories is where I write it all down. Their bad decisions. And their good decisions. The times they got it right. And the times they couldn't have been more wrong. It's where I tell you about them in hopes that they won't be forgotten. Everything they've willingly told me. And what I've had to pull from them. They're imperfect. Just like you. And just like me. But they're mine, and I wouldn't have it any other way. For these are my family's stories.